Tucked away near the Sun Valley in Cascade, Idaho, Middle Fork Lodge is a secluded but upscale lodging experience for guests looking to get away from the hustle and bustle of modern life. In fact, the lodge can only be accessed by arranging a charter flight from one of six nearby airports or through booking a wilderness rafting trip. All guests to the lodge will enjoy home-cooked meals, multiple options for guided excursions, and personalized staff attention during their stay. 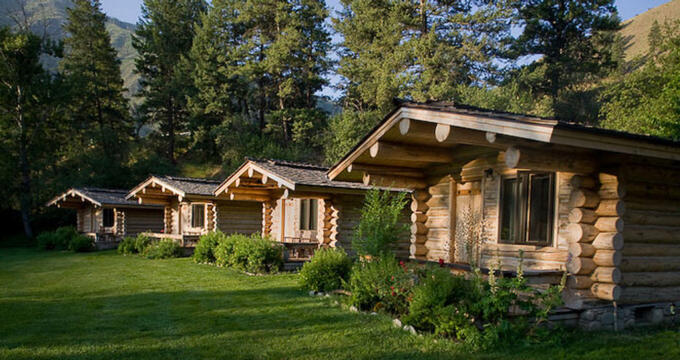 All of the accommodations at Middle Fork Lodge come in the form of guest quarters. Guest quarters are located in a variety of different areas around the resort. One of those areas is the Upper Lodge, which has guest quarters on the second floor. This lodge is located on the hillside, just above where the Main Lodge is situated. All rooms in the Upper Lodge have views of the river and the orchard and come with a king size bed and a private bathroom. Guests who prefer a more private experience can rent one of the six cabins available at the lodge. The Honeymoon Cabin is located between the Main and the Upper Lodges and features a king size bed, bathroom with a bathtub/shower combination, and a sitting deck with panoramic views of the river. Larger groups or families may consider the larger Family Cabin. Located the closest of all the guest quarters to the Main Lodge, this cabin has two adjoining bedrooms (one with a king size bed and the other with two twin size beds) that come with their own private bathrooms. Each bedroom can be entered into privately and has its own deck as well. There are also four River Cabins available for rent. These cabins were designed to provide the best overall views of the lodge property, and each has a king size bed, private bathroom, and a porch where guests can sit and enjoy the view. One additional option for guest quarters is the River House, which is similar in size to the Family Cabin. The building is situated in the banks of the Salmon River with a deck for guests to sit and look out over it. The River House also has two adjoining bedrooms (one that has a king size bed and the other that has two twin size beds). There is a single, private bathroom, but each bedroom has its own, privately accessible entrance. All guest accommodations have a two-night stay reservation minimum. Smoking is not allowed in any of the guest quarters, but there are designated smoking areas on the premises. Staff at Middle Fork Lodge provide five-star guests amenities for all visitors. Each guest quarter comes with toiletries, high-quality mattresses and linens, and personalized staff attention. All bathrooms are made from marble, and each room is heated using local geothermal energy. Guest can also enjoy swimming at one of the multiple on-site pools, which are all heated by local hot springs and open all year round. The cost of each guest’s stay at Middle Fork Lodge also includes three meals, snacks, and all non-alcoholic beverages daily. These are served family style in the Main Lodge’s dining hall. The skilled cooks at the lodge work to provide fresh, upscale options for breakfast, lunch, and dinner. Examples of menu items previously served at the lodge include seared yellowfin tuna with wasabi, roasted herb chicken with apple stuffing, chicory, and goat cheese salad, and filet mignon. Alcoholic beverages like wine and beer can be purchased through the lodge’s wholesaler, or guests can bring their own. Due to the lodge’s proximity to a wide variety of outdoor activities, the staff has compiled a list of the top activities for guests to take part in during a stay at Middle Fork. Many of the guests enjoy local fly fishing. Middle Fork is considered a “catch and release” fly fishing area, so guests cannot keep any of their catches and must use barbless hooks when fishing. However, the area has earned several blue ribbons for the abundance of large (up to 16 inches) rainbow trout and cutthroat trout that live there. Guests must have a valid fishing license, which can be obtained through the staff at Middle Fork Lodge. There are also private fly-fishing tours available, where guests will be led on horseback by an experienced guide to some of the top areas for fishing. Horseback trips are another popular activity at Middle Fork Lodge. These trips are designed for horseback riders of all experience levels and led by a guide from the lodge. Guests will be led through some of the more historical portions of the local area, including shelter pits, hunting blinds, and pictographs used by the Native Americans who inhabited the land. It is also a great way to view the local wildlife. Overnight and custom trips are also available. Guests can choose from a short, three-mile ride to Marble Creek, half-day rides to either Jackass Flats or Thomas Creek, or one of the full days/potentially overnight rides to Mitchell Ranch or Cameron Creek. Space can be limited, and reservations are encouraged. Guests who want to explore the area on foot may enjoy taking a hiking trip. Trips range from easy, quiet hikes to more challenging ones, and the staff at the lodge can help guide guests toward what option will work best for them. There are eight different trips available, many of which follow similar trails to the horseback trips. One of the most popular is the Showerbath Hot Springs, where guests can actually enjoy a shower at the local springs before heading back to the lodge. This hike takes approximately two to three hours in full. There are also other special interest trips available through the Middle Fork. Space for these trips is extremely limited, but they are hosted all year round. Three of the most popular are the trophy hunting, bird watching, and wildlife photography trips.